Microsoft’s annual Build conference for developers kicked off the week starting with a keynote provided by CEO Satya Nadella. He didn’t reveal any new hardware, but instead focused his presentation on solutions spanning from the intelligent cloud to the intelligent edge, the latter of which simply classifies everything we use ranging from smart thermostats to HoloLens in the corporate environment. While Build Day One focused on a general discussion about how the company wants to expand beyond Windows to working with any and all of the technology that its customers utilize, Day Two dug into some of the details its upcoming changes to Windows, Office, and the various tools and programs its making available to developers. 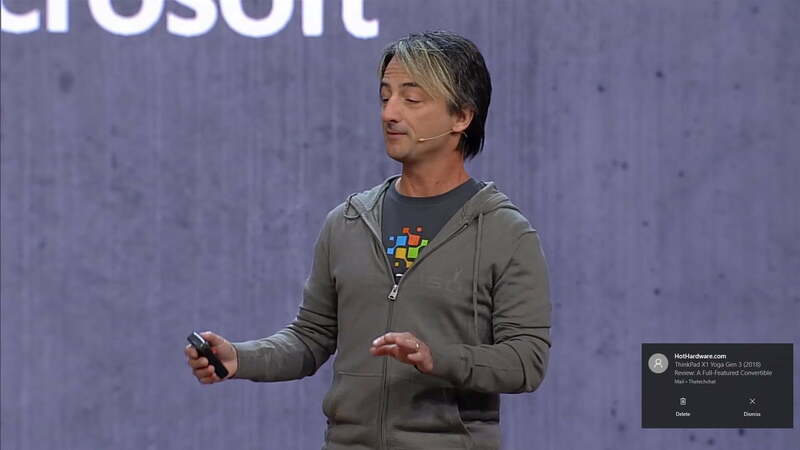 Joe Belfiore, Microsoft’s Corporate Vice President in the Operating Systems Group, was the emcee. Digging through the Day Two keynote, we found a few tidbits hidden among the detailed technical jargon that might be of interest. 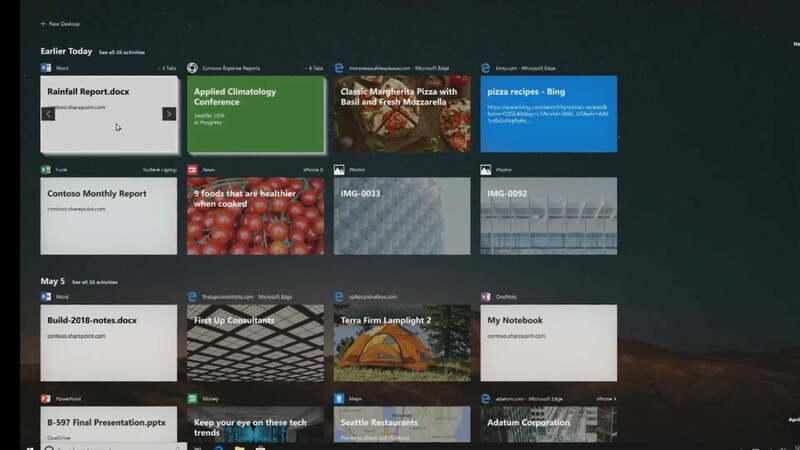 First up are some changes that are coming to the Timeline and Sets features in Windows 10. Timeline is already operational in the recently released April Update, and it will eventually be enhanced with task suggestions pulled from the Microsoft Graph that prompt users to pick back up on important tasks from any device. Sets is another Windows 10 feature that Microsoft is experimenting with and that will arrive on user desktops “someday,” and it’s focused on pulling all of the documents involved with a given task into a single window for easier organization and for more efficiently accessing them when returning to a task at a later time and on a different device. 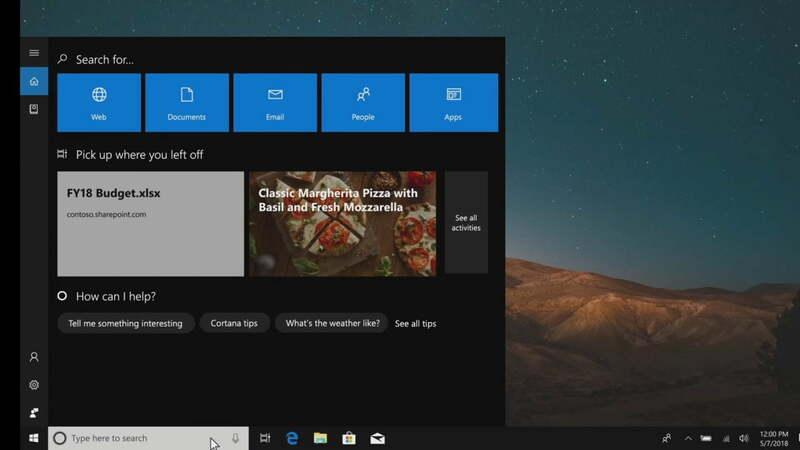 Belfiore showed off some new Sets features, including the addition of recent web browser tabs to the alt-tab key combo for easier access to internet content. In addition, Sets are stored in Microsoft Graph, meaning that there’s an ongoing record of tasks that can be accessed not only by users but also by various applications. And finally, Sets will show up in the Windows 10 Timeline, making them easier to access across time and across devices. Microsoft introduced a new Your Phone app on Day One, and on Day Two it provided some additional details on how the app will allow users to access their phones on their Windows 10 PCs. A number of features were shown off, including the ability to not only view but work with Android notifications, drag and drop phone camera photos to Windows 10 apps, and to copy and paste a variety of different kinds of information between the devices. The Your Phone app will be available to Windows Insiders first, and will roll out to all Windows 10 users in a later build. Microsoft’s Office suite was also covered on Day Two, with a few specific features highlighted during one of the coding sections. Microsoft Word, for example, will receiving new machine learning-driven grammar checking that will provide more subtle corrections and recognize grammar errors that the current grammar checking functionality misses. Next, Microsoft Outlook will be able to access Microsoft Pay. Microsoft is also working to make the Windows Store a more lucrative option for developers. 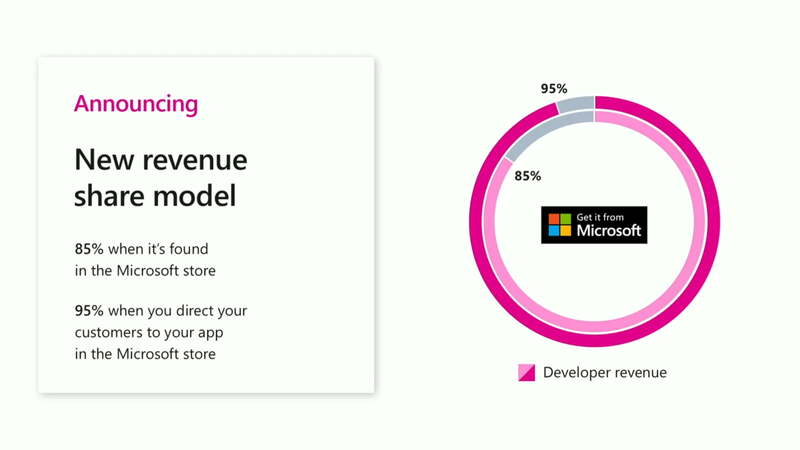 Key to that effort is a new revenue sharing model, which will pass 85 percent of revenues to developers when a user finds an app independently via Windows Store search and then purchases it, and a full 95 percent when a user buys an app after being directed to it by a developer’s own marketing efforts. 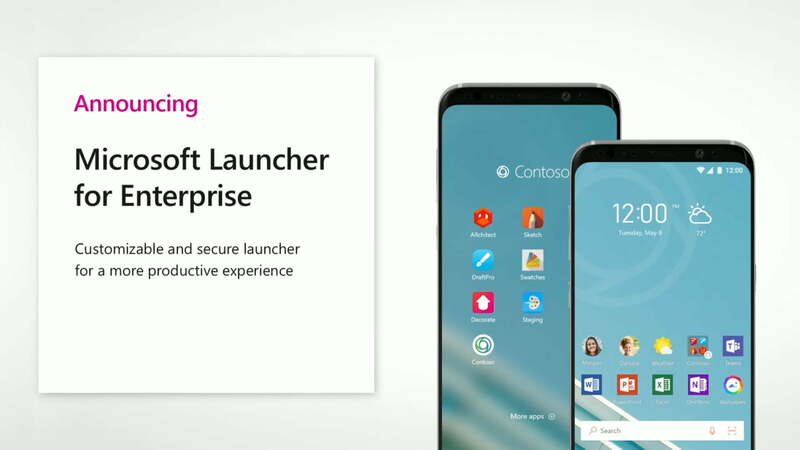 Finally, Microsoft introduced a new version of its Android launcher, Microsoft Launcher, this time aimed specifically at the enterprise. Launcher is a very popular app in the Google Play Store and brings a host of Microsoft-centric features to Android. The new Microsoft Launcher for Enterprise version will bring enhanced customization and security to organizations, and allows administrators to create desktops for specific users with feeds into specific line-of-business systems. Nadella began the Day One keynote emphasizing how artificial intelligence is changing the world, drawing parallels to the Industrial Revolution where, in a span of 20 years, the nation moved from horse-drawn carriages to automobiles. The core technologies of the Industrial Revolution were essentially invisible: the combustion engines in cars, plumbing in buildings, the installment on electrical systems for lighting, and so on. Artificial intelligence and the cloud are just as revolutionary and invisible. One example is Microsoft’s new partnership with civilian drone manufacturer DJI. Commercial drones will feature an integrated Azure IoT Edge component, enabling customers to deploy an artificial intelligence model developed in the cloud right to the drone itself in real time. Even more, that A.I. model can be deployed across the corporation’s drone army scattered across the globe in mere minutes. In an on-stage demo, Azure Internet of Things director Sam George showcased an Azure IoT Edge-based smart camera produced by Qualcomm that detected a stress fracture stemming from a tank within a facility. A second camera discovered a pressure drop on the roof. That is where DJI’s drone comes in: Instead of sending a technician on a long, dangerous journey up to the roof, a company can simply send a smart drone to investigate and correctly identify the problem. Moreover, the drone can use the same A.I. model downloaded to Qualcomm’s camera. This advancement can save both time and money while keeping workers safe. While that may sound like ho-hum news to the mainstream customer, Nadella eventually shifted his presentation to Cortana, Microsoft’s digital assistant for Windows 10. He said that Microsoft wants customers to get the most out of their devices and assistants, and not be bound by a single walled garden. In turn, the company wants developers to have access to the maximum amount of end users. With that, Nadella talked about Microsoft’s collaboration with Amazon to pair Cortana with Alexa. To demonstrate the possibilities, Tom Taylor from the Alexa team and Cortana general manager Megan Saunders took to the stage. Saunders first told Alexa to add milk to her shopping list using Amazon’s Echo speaker, and then told Alexa to open Cortana. After that, Cortana took control of the device, allowing Saunders to check her calendar, and verbally send an email via Outlook to Taylor. 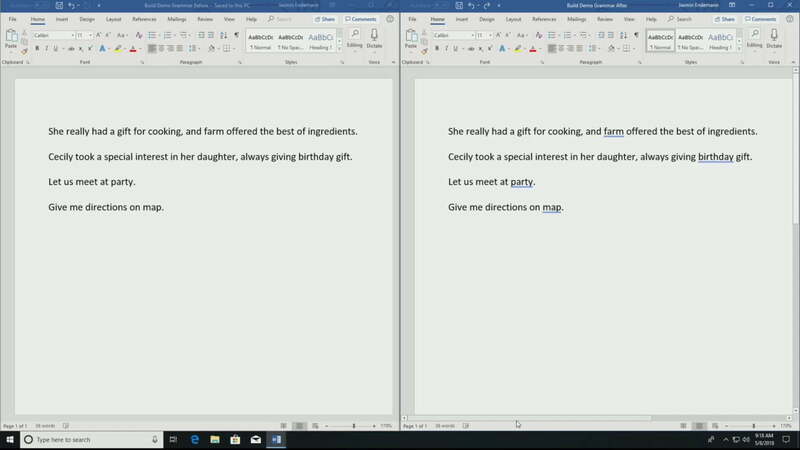 In turn, Taylor received the email on his Windows 10 PC, asked Cortana about the location of the dinner date, and then told Cortana to open Alexa. Amazon’s assistant then took control of Cortana’s space, allowing him to verbally schedule an Uber ride and turn off all Alexa-controlled lights. He even asked Alexa what she thought about her new friend, Cortana. “I like Cortana. We both have experience with light rings, although hers is more of a halo,” Alexa said. Rimshot, please. Another mainstream-friendly portion of Nadella’s keynote appeared in ways the company’s technology streamlines business meetings. It was called the Your Phone app for Android and an upcoming version of Windows 10. Instead of opening and unlocking your phone more than 100 times per day, you can simply see and reply to your phone’s notifications, messages, and photos within the Windows 10 PC app. Consider it as an upgrade to the current method of manually replying to messages through Cortana. For instance, you can drag an image located anywhere on your Windows 10 PC and drop it into an SMS message within the app. If the recipient responds with an image, you can drag and drop the picture into PowerPoint and other programs installed on your PC. 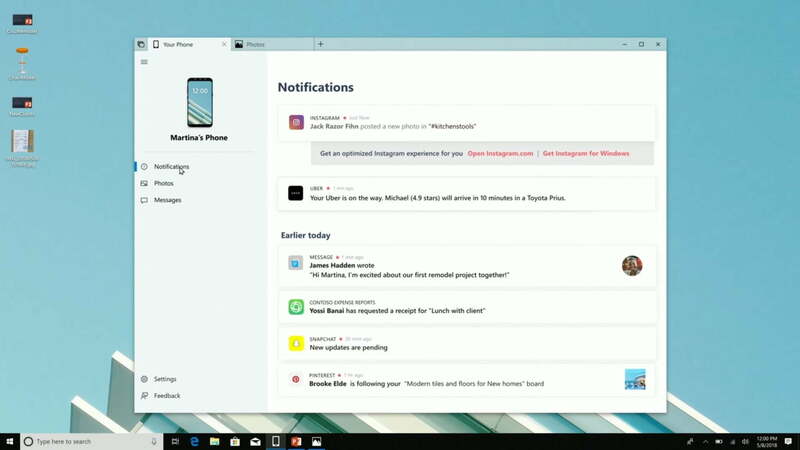 For phone notifications, you can open the equivalent Windows 10 app or view them on the internet. Outside the Your Phone app, this portion of the keynote focused on using Teams, Office 365, and intelligent devices in the meeting. For instance, the smart device seated on the conference table recognized and bid good morning to all who entered the office space. The device also recognized who was speaking and rendered their spoken words within Teams. This eliminated the need for taking notes and provided a full transcript at the end. At the end of his keynote, Nadella said Microsoft wants to empower more people and organizations. The technology needs to reach everyone, thus Microsoft introduced A.I. for Accessibility. It’s a grant program for developers, engineers, and more to create intelligent solutions for individuals with disabilities. A video showcased several A.I.-powered technologies that improve the lives of these individuals such as Soundscape, eye-controlled interfaces, Swiftkey symbols, and the learning tools just introduced in Windows 10 April 2018 Update. Finally, Microsoft briefly revealed the public preview of its new Azure Blockchain Workbench. This platform allows developers to create applications that rely on an Azure-supported blockchain. This blockchain can be linked to Active Directory for easier collaboration and logins. Developers can also use Azure Key Vault to store keys and synchronize data between on-chain and off-chain storage and databases. Workbench even supports Microsoft Flow and Logic Apps.